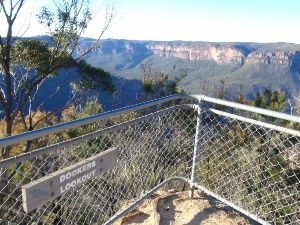 From the car park, the walk follows the sign ‘Perry’s Lookdown Track’ down the hill to a railed lookout. 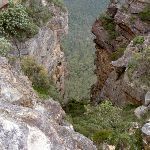 Continue straight: From the Perry’s Lookdown, the walk follows the railed stairs down the hill for a short time until coming to a intersection signposted ‘Perrys Track’ and ‘Dockers Lookout’. 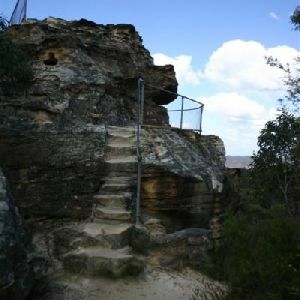 Continue straight: From the intersection, the walk leads for a short distance down the railed path to the visible lookout area, Docker’s Lookout. 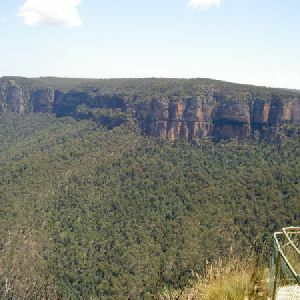 Dockers Lookout, Blue Mountains NP, has views over the Grose Valley and Blue Gum Forest below. 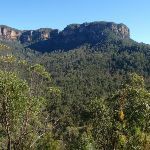 Mt Banks can be seen standing proudly to the north above the valley. Turn around: From Dockers Lookout, the walk heads up the railed path for a short distance until coming to a signposted intersection. 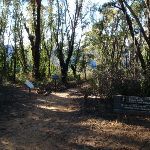 Veer left: From the intersection, the walk follows the ‘Perry’s Lookdown Track’ sign down the hill. 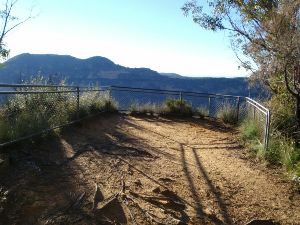 The track cuts across the hill to a bridge, where the track turns left and contours around the hill, before descending onto a lookout with memorial plaque and fire box. 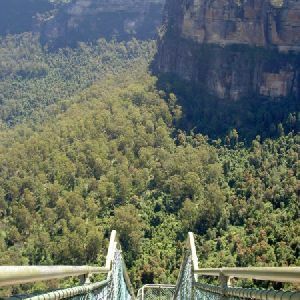 Continue straight: From the lookout, the walk keeps the valley below on the left and heads down the steep stairs, through the gap in the cliffs. 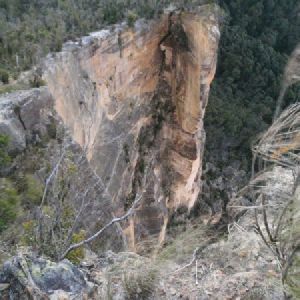 The stairs and handrail climb down through the cliffs, descending away from the main cliff before coming onto the top of a spur. The track tends right, over and down the spurline, and winds sharply down the spurline as it steeply descends for some time. 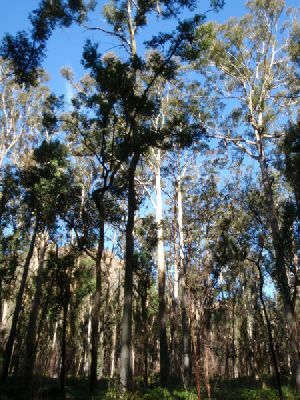 The track heads down the spur, flattening out a few times before coming onto the relative flats of the Blue Gum Forest. The track heads down through the forest for a short time to a signposted intersection. 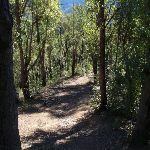 Continue straight: From the intersection, this walk passes behind the ‘Camping only at Acacia Flat 10 mins’ sign, in the direction of the far valley side. The track meanders through the grass and ferns for a short time before crossing Govetts Creek. 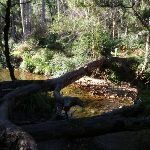 There is a fallen log upstream which many walkers have used to cross the creek. From the far bank, the track follows an arrow marker left, meandering through some more undergrowth. The track then steeply climbs up a hill to a fallen log, after which the track tends right, up the hill towards the top of the spurline. The walk then follows the spurline for some time as it heads up towards the cliffs. 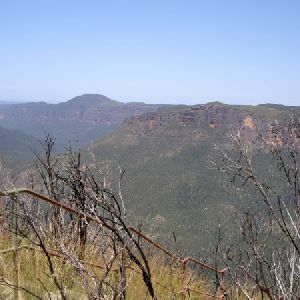 Nearer to the cliffs, the track travels through rockier and more dense vegetation. 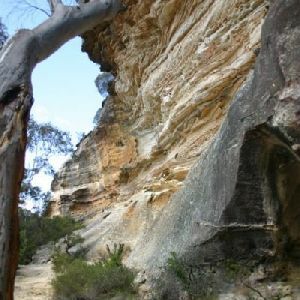 Once at the cliffline, the walk turns left along the base to steeply climb the rocky steps to an intersection between two rock features, in a saddle. 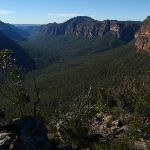 Turn left: From the intersection, this walk heads up the hill for approximately 20m to a rocky outcrop with stunning views down the Grose Valley. At the end of this side trip, retrace your steps back to the main walk then Turn left. 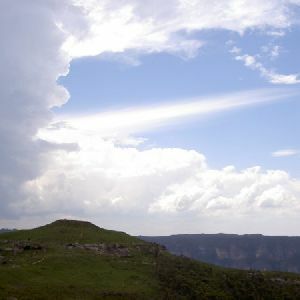 Du Faur Head, Blue Mountains NP, is situated north of Lockleys Pylon. 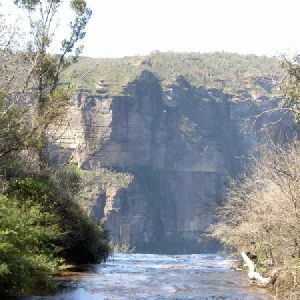 The knoll gives spectacular views up and down the Grose Valley and River. 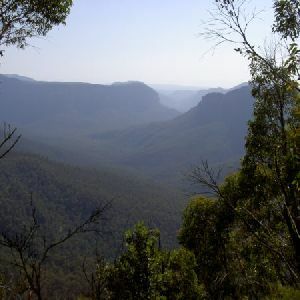 Du Faur Head is worth a visit on your way up or down to Blue Gum Forest from Lockleys Pylon. 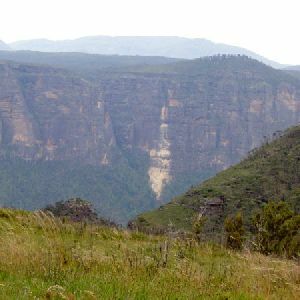 Veer right: From the intersection, this walk heads up towards the large grassy-looking knoll, keeping the cliffs and valley to the right. 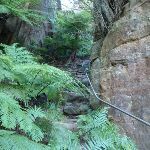 The track winds near the rock for a very short distance before climbing up a large step (just before a small rock overhang to the left). 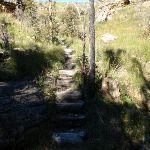 The track then winds over the several rocky knolls and meanders across a saddle before crossing a creek. 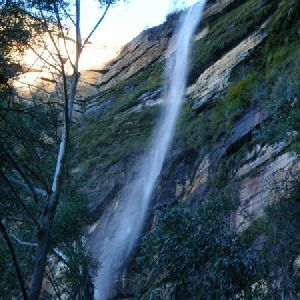 From the creek, the walk climbs a staircase to arrive at an intersection with another bush track. Continue straight: From the intersection, the walk goes down the stairs, keeping the valley behind on the left. 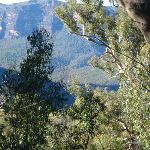 After descending the stairs, the walk follows a faint bush track back up the hill to to an intersection with another bush track. Turn right: From the intersection, this walk follows the sign to ‘Lockley Pylon’ up the wooden stairs to the summit of Lockley Pylon. This is marked by a stone cairn. 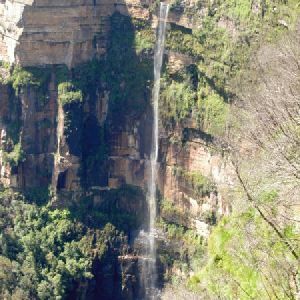 Lockley Pylon, Blue Mountains National Park, gives 360 degree views of the Mt Hay area with excellent scope over Fortress Creek Waterfall and into the Grose Valley. Turn around: From the cairn on top of Lockley Pylon, this walk heads down the wooden stairs away from the valley. The walk heads down the stairs to a signposted intersection. Veer right: From the intersection, this walk heads down the stairs away from the knoll, past the ‘Lockley Pylon’ sign, and travels along the ridge. The track continues past two knolls on the right as it climbs from the clearing up to the tree line. 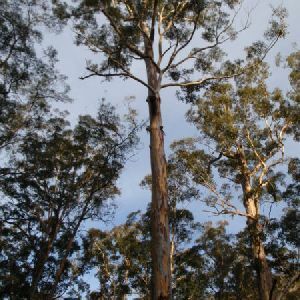 The track meanders up through the trees for approximately 400m to an open area. 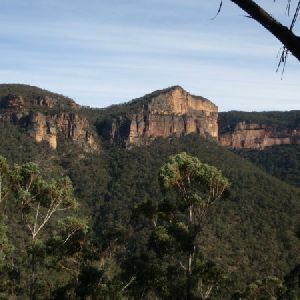 The walk climbs to the top of the ridge, below the summit of Mt Stead, a rock feature to the right of the track. 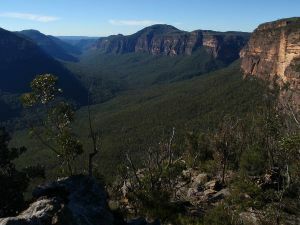 Continue straight: From the intersection, this walk heads away from the views of the surrounding valleys and keeps the rock feature on the right of the track. The track enters the tree line then undulates down the plateau through the trees. 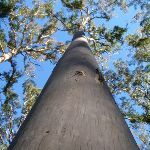 The walk continues along a sandy saddle which is flat for approximately 100. 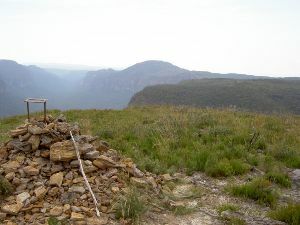 The track then climbs out of the saddle and over a knoll to traverse the following saddle to the intersection below the northern Pinnacle. Veer right: From the intersection, this walk heads towards the rocky knoll, keeping them above on the left. The track continues beneath the Pinnacles to come to an intersection below the last Pinnacle. Veer right: From the intersection, this walk keeps the pinnacles on the left of the track as it heads down the hill. The track tends right as it descends approximately 400m down to the signposted car park. 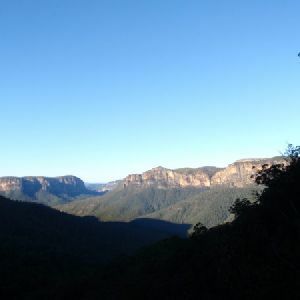 Around 4.2km of this walk is very steep, whilst the remaining 3.8km has short steep hills. 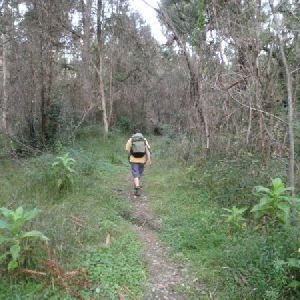 Around 5km of this walk follows a rough track, where fallen trees and other obstacles are likely, whilst the remaining 2.6km follows a formed track, with some branches and other obstacles. 7km of this walk has directional signs at most intersection and another 660m has minimal directional signs. The remaining (75m) is clearly signposted. 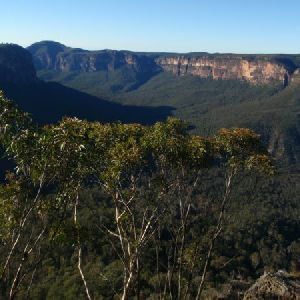 Around 6km of this walk requires no previous bushwalking experience, whilst the remaining 1.8km requires some bushwalking experience. 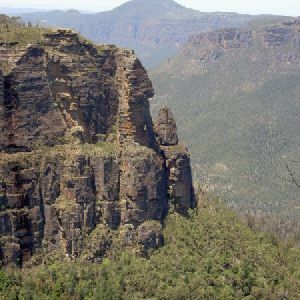 Around 4.2km of this walk has limited facilities (such as cliffs not fenced, significant creeks not bridged), whilst the remaining 3.8km has limited facilities (such as not all cliffs fenced). A list of walks that share part of the track with the Perry’s Lookdown to Lockley Pylon walk. 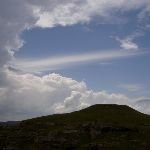 A list of walks that start near the Perry’s Lookdown to Lockley Pylon walk. 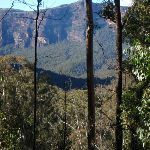 http://new.wildwalks.com/wildwalks_custom/includes/walk_fire_danger.php?walkid=nsw-bmnp-pltlp Each park may have its own fire ban, this rating is only valid for today and is based on information from the RFS Please check the RFS Website for more information.